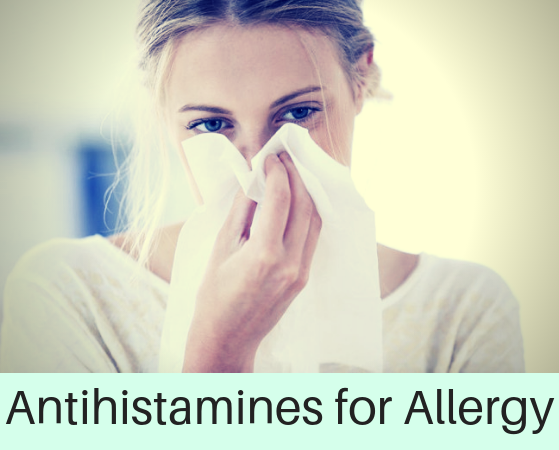 Antihistamines are important drugs in the treatment of allergies, including pollinosis about which we talked today. The main representatives are: Dimedrol, Diazolin, Suprastin, Pipolphen, Tavegyl and others. Because of the severity of side effects, the fact that the “risk-benefit” ratio tends towards the first, these drugs are NOT the drugs of choice for the first line in either children or adults in the treatment of allergic diseases. This is stated in all conciliatory international documents. What are the Disadvantages of Antihistamines of the First Generation? The reception of antihistamine of the 1 generation should be limited, and not used universally because of the wide range of unwanted effects!!! So, there are Antihistamines of the 2 generations: Loratadine (Claritin), Desloratadine (Erius), Cetirizine (Zirtek, Zodak), Ebastine (Kestin), Ketotifen and others. Fenistil is a preparation of the first generation. According to the mechanism of action, it is closest to Antihistamines of the 2nd generation and differs from the first by a much less pronounced sedative and muscarinic effect, high antiallergic activity and duration of action. Children should not take antihistamines allowed for the elderly, simply breaking off a piece. Antihistamines do not stop bronchospasm. Is it possible to combine Singulair with Zodak during pregnancy? We are allergic to the pollen, ie we need to take antihistamines from the end of March to November. Is such a long-term use safe? Can it be dangerous? Do I need to take breaks and change drugs so that I do not get used to it? it is safe, you can take as much as necessary. A study of these drugs safety showed that they can be taken with any duration without interruption. Xyzal relates to: AG1 or AG2? We are always prescribed Xyzal. The second option is right. Are antihistamines prescribed for any form of asthma? I found the answer to my question. Correctly, I realized that they are used to treat allergic rhinitis and hay fever. Also, are not appointed or nominated for bronchial asthma? Yes, they are not used to treat asthma. Good afternoon! Is it necessary to take already now Montelukast or antiallergic if the analysis of a blood has shown insignificantly increase in parameter IgE on a birch – 0.83 and a rye – 0.47. The child was almost 4, polynomial in previous years was not diagnosed. But there are obstructions due to contact with animals and dust. No, you need to monitor the tolerability during the flowering season. I missed whether there was any mention of Fexofenadine. May it be chosen for 3 months treatment of rhinitis? The allergist told us to choose the drug based on the effect produced. Or is it better to take levocetirizine for a long period of time if your child is 13 years of age?